Companies do amazing things. The quality of life we enjoy today would not exist without the incredible achievements made by companies. Over time companies acquire great skills, organize unique networks of other companies to achieve common goals, and benefit countless people along the way. It’s in our nature to build such organizations; and when companies have the time to reach their full potential, their contribution to the people they touch and to society is immeasurable. But not all companies live up to their full potential. In some cases, it’s because leaders don’t see the important contribution their company is making in the world and appreciate the value of the organization they are building. In other cases, leaders have the desire to build a lasting organization but are not sure how to go about doing it. We believe that building a lasting company can only be achieved if leadership commits to a purpose that is meaningful and important to the company’s stakeholders and pursues strategies and actions that are aligned with that purpose. We call this Purposeful Leadership. Only then can an organization harness the power and resources of its Stakeholder World and create real value for its shareholders. Ratoff Consulting is committed to building lasting companies that matter by working with organizations to discover their purpose and develop successful business strategies and financial structures that are aligned with and support that purpose. Every organization operates inside of its own unique Stakeholder World. By Stakeholder World we mean all of the individuals and groups of individuals who impact or are impacted by the organization. These include employees, customers, investors, vendors, communities, competitors and many others. Your organization’s relationship with this world will determine its success and longevity. Many of those relationships oftentimes occur to leaders as costs that must each be managed independent of each other. We believe that trying to manage stakeholders this way is a very difficult if not impossible task, and can be counterproductive in delivering value to your customers. We also believe that your stakeholder world by definition contains all of the resources you will ever need to be successful and that those resources can be harnessed to your advantage if your stakeholders’ interests are aligned with yours. To do that requires that the organization take on a Purpose or Mission that is meaningful and important to its Stakeholder World and then enlist your stakeholders’ support in fulfilling that Purpose. Active engagement in this process will uncover many opportunities for your organization to harness the power of your Stakeholder World. This process, which we call Purposeful Leadership, begins by discovering your organization’s purpose, broadening it to be meaningful to all of your key stakeholders, developing and implementing a strategy that is aligned with that purpose, and then actively enrolling your Stakeholder World to embrace and support you in this Mission. Every business has the capacity to pursue Purposeful Behavior as a best practice in optimizing stakeholder value and creating lasting value for its shareholders. 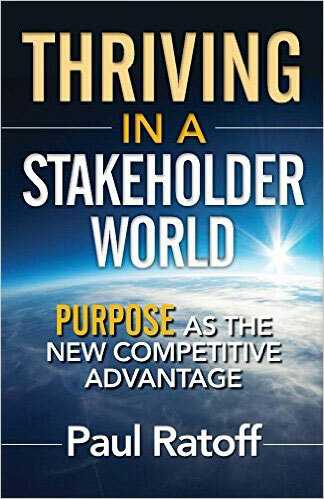 To learn more about Purposeful Behavior, we recommend reading Thriving in a Stakeholder World, Purpose as the new competitive advantage. Shifting influences among stakeholders has caused leaders to consider new ways of managing their organizations and navigating through a very different and ever-changing world. This book demonstrates to leaders that purpose can be the driving force behind this new management style and also provide a competitive advantage in their markets. The book offers two fundamental concepts that when embraced and practiced authentically, can be transformative for organizational success. First, one must look at an organization strategically as if operating inside of its own stakeholder world. This stakeholder world is represented by the many individuals and groups of individuals who impact, or are impacted by, the organization. Enjoy a taste of the book now. To be successful in today’s world, an organization needs to think beyond maximizing shareholder value. Organizations need to manage from the perspective of stakeholder value and bring back purpose as an effective management tool. and make it universally accessible and useful. As you are undoubtedly aware, Google radically transformed the way most people access information on the Internet. Throughout the years, the company added products like Gmail, Google Maps, and the Android operating system that would become fundamental to the lives of users across the world. Each month, Google is used for search by over a billion unique users. During the summer of 2013, a five-minute blackout of Google caused global web traffic to dip by 40 percent. You will probably use at least one of their products today. What makes Google unique is not just its great success as a global enterprise but its commitment to making a huge contribution to society that is meaningful and important to most of the people who are impacted by them. In addition, Google recognizes that it is also impacted by the very same people and must address their needs as well. In the prospectus for their IPO in 2004, Google stated: “Don’t be evil. We believe strongly that in the long term, we will be better served—as shareholders and in all other ways—by a company that does good things for the world even if we forgo some short-term gains.” What an incredible thing to put in writing. This ideal has not always been easy to live up to over the years. Google has come under criticism for censorship in China and violations of privacy that some feel conflict with their “Don’t be evil” ethos. But on the whole, Google is an excellent example of how a company can consider its many stakeholders in pursuit of its mission. This book offers two fundamental concepts for leaders to consider when building a lasting organization. These concepts are not earth shattering or, for that matter, even all that new. But when they are embraced and practiced authentically, they can be transformative for organizational success. This book examines different applications of those concepts in developing successful business strategies to help you not only survive, but thrive. What are these two concepts? First, one must look at an organization strategically as if operating inside of its own stakeholder world. This will be discussed in more depth, but essentially, the stakeholder world means or is represented by the many individuals and groups of individuals who impact, or are impacted by, the organization. The second concept is that, to ensure an organization’s long-term success, pursuing purposeful behavior will be the best practice for managing stakeholder value inside its stakeholder world. By purposeful behavior, we mean taking actions that are consistent or aligned with a purpose that is meaningful and important to all the organization’s stakeholders. These two concepts were developed from three different insights: First, organic development in nature can be a useful model for understanding behavior in organizations. Second, the historical development of equity-capital markets and capital providers, and their influence over public companies, has shaped our view of responsible corporate behavior. And third, current world trends are shifting influence among various stakeholders, which in turn impacts organizational behavior. Let’s look at these in a little more detail. We assume that all life-forms are dependent upon their environments (both internal and external) for survival and success. Lifeforms that can adapt to or manage their environment are more likely to survive and thrive. By adapting or managing their environment we mean that they can direct and leverage resources to their advantage and as a result of chance (such as mutation and natural selection) or conscious choice, will be the successful ones in nature. Customers—those who pay the organization for delivery of its products or services. Note that a customer may be a channel of distribution, a consumer, or a donor. Channels of Distribution—those who directly receive the organization’s products or services, typically for eventually passing on to customers or consumers. Consumers—the end users of the organization’s products and/or services. Donors—those who contribute resources to the organization, most typically in the case of a non-profit organization. Owners/Equity Holders—those who own an interest in the organization, or, in the case of a board, represent the interests of the owners (in the case of a non-profit, the “owners” might be the community). Debt or Equity Capital Providers—those who have provided money to the organization. Employees—those who receive payments for working for the organization. Executives—a subset of employees who lead the organization. Suppliers—those who provide products and/or services to the organization. Competitors—other organizations who provide similar products or services. Community—consisting of the “local communities,” those who live and work in the geographic area surrounding the organization’s facilities, and the “greater community,” those who live beyond the local geographic area but who are impacted by activities pursued or engaged in by that organization. The historical development of equity-capital markets has played an important role in shaping all organizational behavior. In the early years, prior to 1950, it was a widely dispersed market. Publicly traded firms were listed on various stock exchanges or sold “over the counter,” predominantly through brokerage firms, which served as the primary intermediary. There was a relatively small mutual-fund industry and limited number of large buyers of securities. For the most part, individual investors expressed little interest in, and exerted little influence over, corporate management behavior. The significance of this to organizational behavior was that organizations had the freedom to think long term if they chose to. Since the cost of capital was relatively low, longer-term investments with longer paybacks were more feasible. Furthermore, leaders could stay committed to the organization’s original purpose without worrying so much about investor interference. After 1950, markets began to change and market influence became more concentrated. The fund industry grew rapidly due to the bull markets in the 1980s and 1990s. Many new fund products were introduced and retirement accounts grew significantly. In 1970, there were 360 funds with $48 billion in assets. By 2011, there were 14,000 funds managing $13 trillion in assets. With greater aggregation of capital among large pension funds, mutual and exchange-traded funds, and investment banking firms, more influence shifted to fund managers. Fund managers time horizons were far shorter than the company leaders; their survival and compensation depended upon short-term performance for their investors. They expected, and often demanded, consistent returns from the companies they invested in. State and federal laws related to corporate governance were passed that tended to favor shareholders over other stakeholders. As corporate America grew and matured, there was a gradual shift to more professionally managed organizations, with leaders having a smaller financial investment in the organization. These managers compensation, stock options, and tenure depended upon maintaining high returns to their shareholders. Their time horizon was more in line with their tenure. How has all this impacted organizational behavior? Organizations and their leadership felt much more beholden to the needs of shareholders. In many cases, company purpose was redefined to mean maximize shareholder return or value. This way of thinking may have been useful in the past, but will it hold up in the future? Let's look at some current trends. There are many world trends that we've seen emerging since the late twentieth century, which are giving other stakeholders more influence over the behavior of organizations. Here are a number of trends that are important for our discussion. An expanding global economy: What used to be dumping grounds are now fertile markets. The whole world is our customer now. New emerging markets are being found and companies sell everywhere. An explosion of knowledge: All stakeholders have access to more and faster information. They are more knowledgeable and cannot be fooled as easily. They can demand action on their concerns. Instant communication: Stakeholders can more easily and more frequently communicate with each other (within the group and between groups). Based on their increased knowledge they are able to make their needs known, more relevant, and more difficult to ignore. Capital availability: Although the recent recession may be a hiccup, there is much more capital available than ever before. More capital means chasing fewer deals, which lessens the relative power and influence of capital. A growing demand for knowledge workers: There is a growing demand for knowledge workers, and with demand comes power. Social awareness: Consumers expect their brands to share the same concerns they have for the environment and their quality of life. Wanting to make a difference: In a more affluent world, more people are interested in making a difference in their communities and in the world and they judge their institutions accordingly. Greater interconnectivity and interdependence among organizations: Organizations today have far more stakeholders and those stakeholders are more dependent upon each other for survival. It is clear that leaders can no longer focus solely on maximizing shareholder value. Given these current trends that have created a far more robust and influential stakeholder world, many other stakeholder groups can mobilize quickly and affect an organization’s health as did certain communities that didn’t want a Walmart store in their neighborhood or where franchisees of McDonald’s organized to push back on menu complexity. Therefore, leaders must now focus on managing or optimizing stakeholder value, a relatively new concept. Often though, corporate actions taken in an effort to manage stakeholder value provide benefit to one group of stakeholders at the expense of others. You might call this approach a win-lose strategy since you are winning one group of stakeholders at the expense of another group. Many actions taken by organizations under the guise of corporate responsibility in response to one stakeholder group’s influence may be perceived by other stakeholder groups as not in the organizations’ long-term interest. Win-lose strategies tend to be short sighted and are not sustainable in the long run, since they waste resources. Leaders must develop strategies that can balance the needs of competing groups and create win-win results. One way to achieve this is to lead from purpose, reclaiming its central role in the strategic decision-making process. Leaders today should reflect on the role of purpose in their organizattion’s early development. Their organization was formed for a particular purpose or goal; that purpose was meaningful and important to many if not all of its initial stakeholders and served as a common bond or rallying point for action. It was the initial source of agreement among stakeholders and guiding compass in planning future courses of action. Again, this isn’t a new concept. Many business books speak to the benefits of having a mission or purpose. You have likely even read one, like Good to Great or It’s Not What You Sell, It’s What You Stand For. Traditional business-planning methodologies include mission or vision statements as key elements in formulating a business strategy. What I’ve found, however, is that as organizations evolve and mature, that initial purpose oftentimes becomes a distant memory or is forgotten entirely in the planning process, and no longer serves as the fundamental context for strategic decision making and action. Business decision making tends to rely more heavily on return on investment (ROI) or other more quantitative factors. As our evaluation processes and tools have become more sophisticated and analytical, we seem to further remove from the decision-making process those concerns that are more abstract in nature such as purpose alignment. As organizations grow and evolve, some may find their original purpose less relevant to their current role in the world or to the current stakeholder world, providing further justification for abandoning purpose as a useful management tool. Instead of abandoning purpose, leaders should consider rediscovering purpose for their organization, one that is meaningful and important to their new stakeholder world, and then leading from that. This is called purposeful behavior. Purposeful behavior by its very nature will always create a winwin opportunity for those stakeholders that find that purpose meaningful and important to them. The challenge then is to have a purpose that is meaningful and important to your stakeholder world. But once you have that, it becomes easier to optimize stakeholder value. How do you bring purposeful behavior to an organization? In the following chapters we will address the topics below that will allow you to incorporate purposeful behavior into your company and thrive in this new stakeholder world. What is your stakeholder landscape and who are your key stakeholders? What is the role of key stakeholders? How do I find purpose? How do I make it broad enough? How do I use purpose in planning? How do I stay aligned? What are the key corporate values for supporting purposeful behavior? How do you measure success in pursuit of your purpose? What other legal entities are available? How do I remain socially responsible? Is there a better way of looking at transitional planning and exit strategies? Are sales and profits still important for purposeful companies? We argue that purposeful behavior is the most effective approach to managing stakeholder value. However, purposeful behavior will not always be enough. It is still possible to pursue a worthy cause and negatively impact a stakeholder group. Organizations will need to be diligent in identifying those instances and address them appropriately within a win-win scenario and within the context of their purpose. Google’s core value of “Do not harm” serves as recognition of the importance of maintaining a supportive stakeholder world. Based on many underlying trends, organizations are facing a new and very different stakeholder world. Effective leaders must recognize that focusing on managing stakeholder value must be the new norm. Organizations cannot manage stakeholder value by benefiting one stakeholder group at the expense of others. Staying aligned with a purpose that is meaningful and important to your stakeholders is an effective way of managing stakeholder value. Purposeful behavior is not enough. Organizations still need to be sensitive to and address the harm they may cause in pursuit of their purpose. Paul has been a tremendous coach. Each day I face a wide array of complex circumstances and subjects that are sometimes unknown or foreign at best. In almost every situation Paul demonstrates an uncanny ability to cast darkness on what is not important and illuminate only what is. The resulting clarity has led to better decisions and financial results. Additionally, Paul dramatically improved the quality of our financial data so that we can now manage our business by the numbers. Paul quickly became and remains a trusted advisoron all issues that affect the financial health of my business. Paul has helped us better understand how our business is performing by providing more timely and useful financial reporting He has helped us more effectively plan our growth and cash flow needs by implementing a budgeting process. Paul helped us set up more appropriate accounting practices so that we could collect the right kinds of data and measure our performance in ways that helped us manage the business more profitably. I can, without hesitation, recommend Paul for any business in need of solid and reliable financial reporting and analysis. I am available to personally endorse Paul and provide details on the work he has performed for our company.